Don’t be distracted by the revived, historic name, this new Z650 is an updated successor to the ER-6n middleweight twin. That bike – novice-friendly, perky and affordable – was already a class-leader. This, with a new lighter chassis, boosted engine and improved looks, is better still. 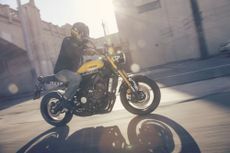 The four-stroke successor to the legendary two-stroke learner sportster may now play to a different soundtrack, but it remains a mini-superbike and the ultimate learner dream bike. The naked, roadster version of Aprilia’s exotic RS 125 sportster is back and better than ever. With classy, RS 125 running gear, a useful, four-stroke powertrain, and Tuono 1000 styling, A1-compliant roadsters don’t get much more appealing. The unfaired CBR650F replaced the Hornet in 2014, and this mild update gives the budget but fun middleweight four some welcome extra oomph and attitude. KTM’s flagship adventure bike now comes in three 1290 variants: T touring, R off-road, and this S road-biased all-rounder. With 160bhp and cutting edge electronics, adventure bikes have never been so flash, or fast. This new A2 licence/learner-friendly cruiser is based on the pleasant CBR500 parallel twin, but it’s got an even lower, easier, pared-down style. Just when you thought affordable, sporty, 600-class all-rounders were a thing of the past, along comes this. It’s not flash or fancy, but the CBR650F pretty much does it all, and for under £7,000. The new Z900 revives its historic name, but the bike can’t match the ‘70s original’s significance. Effectively a Z800 replacement, it’s a junior Z1000, without that bike’s electronics. While it’s a decent option if you want an affordable Japanese four, it can’t match Triumph’s latest Street Triple. Suzuki’s slightly budget adventure offering was reintroduced in 2014 with a reworked version of the old TL1000 V-twin. It was worthy, rather than thrilling. This year brings a few tweaks to meet Euro4, and while it’s better, it’s not better by much. The class-defining V-Strom may have been the original and best midi-adventure bike since 2004, but despite a 2011 facelift, it was overdue an update. This restyle with extra goodies delivers, but doesn’t leap ahead. The revamped, renamed version of the old ER-6f is much more than just a facelift of the popular faired middleweight twin: it’s lighter, more potent and better equipped, too. As a sporty first middleweight, it’s one of the best. In a nutshell, it’s the sportiest Sportster yet. Harley’s sweet 1200 Sportster gets the café racer treatment with a sporty riding position and uprated suspension and brakes. It works, too. Effectively Yamaha’s universally-acclaimed and perky three-cylinder roadster, the MT-09, but re-styled with a more fashionable, retro-inspired look. Like the MT, the XSR has an awful lot going for it, but it’s debatable whether it’s worth the £500 premium. Triumph’s fully revised retro roadster and now 1200cc twin gets a softer, more affordable, 900cc little brother. It’s just as friendly as the 800cc original – only better. Adventure-styled, sport-touring version of the perky and value-packed MT-07 twin follows in the successful footsteps of its three-cylinder Tracer 900 bigger brother. It’s an equally compelling package. Harley flagship full-dresser showcases its touring family’s all-new-for-2017, four-valve, partially liquid-cooled ‘Milwaukee-Eight’ engines. Introduced in 2009, the bare and black ‘Iron’ has assumed the mantle of being Harley’s cheapest, entry-level bike. Since then, it’s proved a great success, and is the best-selling machine of its type. The ‘60s-styled, up-specced version of Triumph’s popular retro roadster was finally replaced by the all-new T120 in 2016, partly due to Euro4, but it remains a cute and willing used buy.